Arnim Zola called, he wants his design back. Daddy will be back for the sequel. Me, not so much. Harley never realised she'd gotten pregnant until she was in hospital for the delivery? Bwuh? There have been a few cases where something like that allegedly happened; just as in those instances, it is much more likely that she was in denial of her situation. ...Seriously? Harley "failed" and "made a mistake" because she didn't want a baby with her abuser? 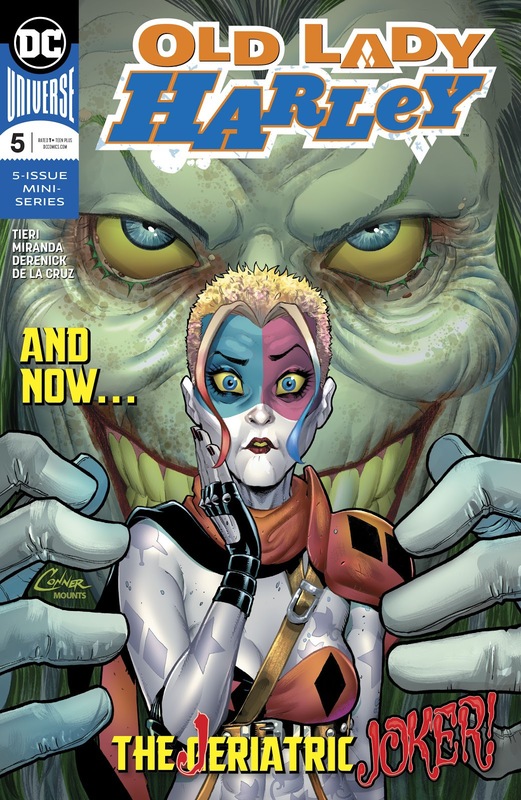 Screw this, screw this and its stupid improbable grandma cleavage right on the freaking cover. What a entire waste of a concept. What should she have said to him then? 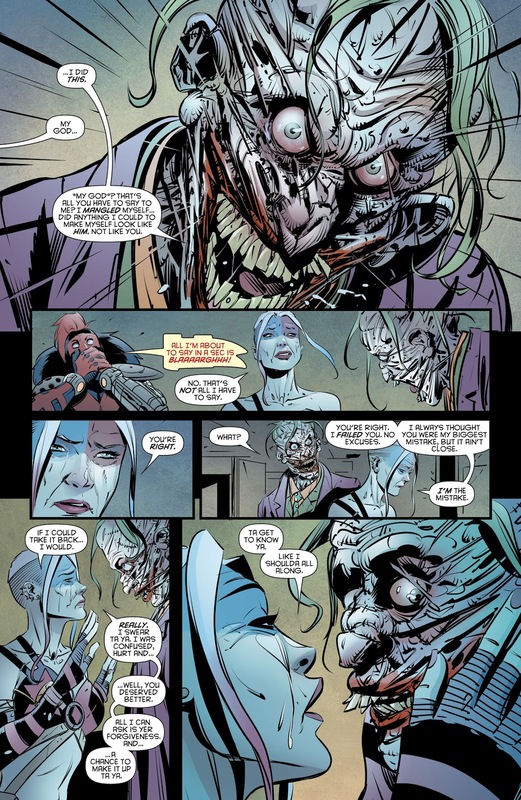 "Faces of Evil wasn't all that great and the Joker works way better as--"
No, in all seriousness, it's less that she's saying this to him and more that the narrative seems to be validating it, and I'm just thinking: uh, giving the kid away to a stable home with good parents is probably the best thing that can happen to him, I feel that Harley made a pretty sound decision here. Like, I think you have a responsibility to make sure every kid that's born has a good home and a good upbringing, but... some people don't want to be or aren't capable of being parents? Maybe not Harley and certainly not the Joker. 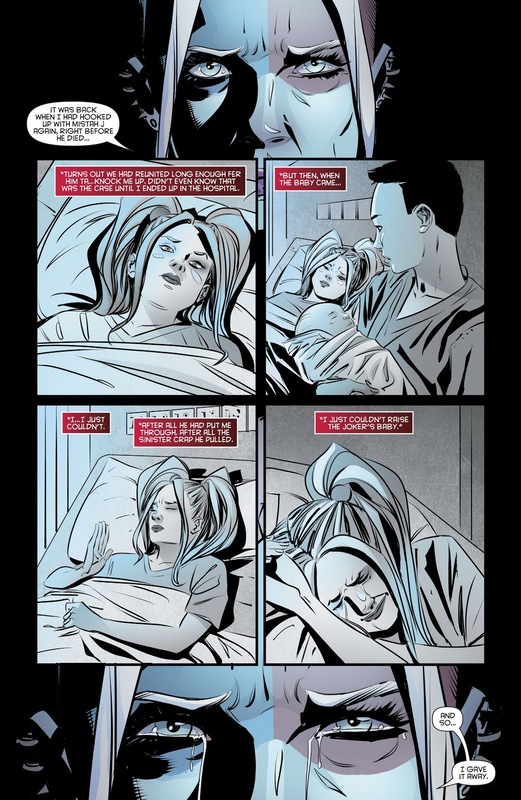 I don't think Harley failed by giving her baby away to someone who would care for it (as opposed to neglecting or abusing it), but it feels like the narrative is pushing it that way. Possibly I'm wrong. Yea - nah there are other ways to handles this. And other dialogues to have. Something like "I wanted ot give you a chance" or "Give you something better"
"I wasn't in a place to raise/provide for" or something else. Not taking all the blame and going "mea culpa" for making a responsible decision. The book making this their closing note with her taking all the blame and crying about the subject implies that that is the "correct" mindset. If they were taking more time to explain and explore the notion of adopted out kid than one could argue that the mindset behind making it isn't "She should have kept it. How dare she not." "I was severely traumatised and in absolutely no condition whatsoever to be raising any baby at all, let alone a baby whose physical likeness to my abuser* could trigger a relapse into psychosis. Giving you up for adoption ensured you'd grow up with guardians who could give you a much, much, much better shot at a good life. I'm sorry it didn't work out, I'm sorry you suffered. But it would have been worse if I had kept you. You wouldn't even have had a chance." *newborns pretty much all look the same, but as they grow up, they usually start looking more and more like their parents. There is a pretty good chance the kid would have inherited Joker's facial features. 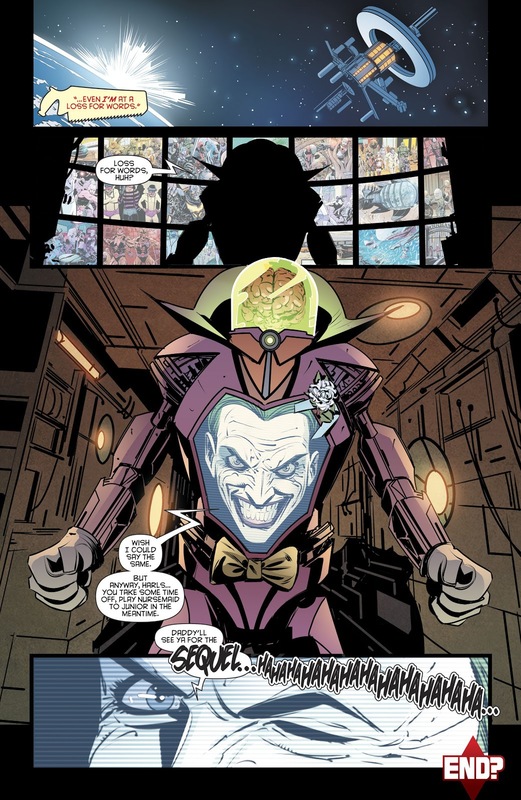 Also I'm a bit lost as to why the kid tore himself up to be the Joker. Is the madness genetic? Is that the take? 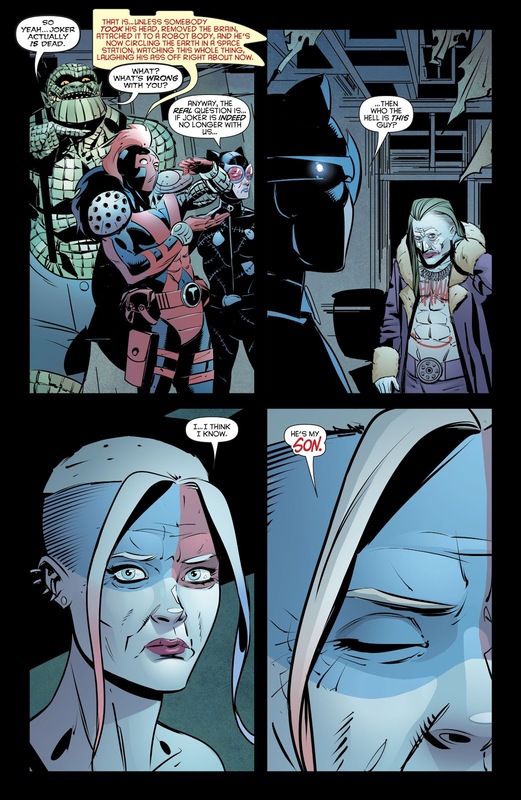 I'd rather we spent more time with the kid than Harley at this point. Cause there's a lot there to be mined and unpacked. Or perhaps we should just burn the luggage. Like real life examples - most people don't look back on their crazy/disliked/evil genetic predecessors and go "yes - that's what I want to hang my identity hat on. THIS"
Or for a more close to example for basis of comparison - the gentleman who discovered his absentee father was Charles Manson. The man was apparently very horrified and rather confused. He did make contact with Manson but definitely didn't decide to go Helter Skelter on anyone. This became awfully dark and serious all of the sudden. Then back to being absurd at the end just as sudden.